The Internet of Things – buzzword or bandwagon? “The most over-hyped technology in development today” is how technology analysts Gartner recently described the “Internet of Things” (IoT). Even though the phrase itself was coined in 1999, the Internet of Things is currently an innovation buzzword. It is claimed 20-40 billion devices will be connected to the Internet by 2020 and if this happens, it will be the next big bandwagon. When you imagine how the IoT could change our lives, it is no wonder this futuristic vision is causing excitement and investment. I imagine how it could affect my daily life. My flat could know when I’m coming home, and set the heating and lighting to the ideal setting just as I arrive, based on weather, time of day and my personal preference. 100%Open recently ran some hackathons with SIGFOX to explore the potential applications of the IoT and build innovative concepts, with some interesting results. See here. When you consider the implications for industry and how cities operate, that’s when things get really interesting! 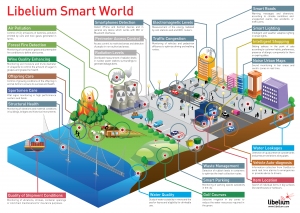 This visual, by IoT platform provider Libelium, shows some of the wider possibilities. In the UK, the Future Cities’ Catapult are working with leading technology companies, Milton Keynes Council, the Connected Digital Economy Catapult and The Open University to build the UK’s first city-wide, open access demonstration network. The project will deploy a large number of low power, connected sensors around the city and test out different business models. This can enable everything from intelligent parking systems in cities to networked bins that signal when they need to be emptied. The result – less frustrating and more efficient urban living. Standardisation – Interoperable global standards need to be developed, both within applications and between domains to enable cooperation between different applications. Data storage and management– The IoT requires the collection and management of huge amounts of data. Privacy – There is already a lot of resistance to the collection and storage of personal data, which will continue to escalate. Security – Billions of connected devices represents a huge security threat to companies and individuals. Smart solutions to deal with hackers need to be developed. At 100%Open, we have been working with clients to understand and overcome these challenges. We have worked with BAE Systems Detica and its technology partners to explore the security challenges in a hyperconnected – see here. We’ve also been collaborating with Maurizio Pilu and the Technology Strategy Board to design and facilitate a series of workshops for 10 pilot projects for the Internet of Things Convergence Programme. See the video below. The IoT opens up new opportunities for innovation and for making money. It is encouraging to know that in the UK, we are at the forefront of research and beginning to navigate a path. For organisations, the IoT requires opening up, sharing and working in new ways. This poses significant challenges around trust, security and ownership of data and will require new levels of collaboration, not least with citizens themselves. Companies and organisations that want to benefit from the IoT will need to demonstrate the value they offer and build trust with individuals before the full productivity of the IoT can be realised. Only then can it move along Gartner’s cycle through the “trough of disillusionment” to the “plateau of productivity”. Or to put it another way, a speeding bandwagon.